Oh "Mamma Mia", lets travel to a Greek Island with Susquehanna Trailways. 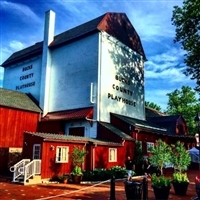 Bucks Co Playhouse - Mamma Mia! Travel to New Hope, the small town with a big city feel. Before the show, wander around the cobbled-stone paths, exploring unique shops and art galleries sprinkled throughout. Travel to New Hope, the small town with a big city feel. Before the show, wander around the cobbled-stone paths, exploring unique shops and art galleries sprinkled throughout. Venture into the Bucks County Playhouse for lunch overlooking the Delaware River. Afterwards, move into the theater to enjoy a big Broadway musical, "Mamma Mia!" Allow yourself to be transported to a beautiful Greek Island, where Sophie sets out on a quest to find her father on the eve of her wedding. Meet the three men from her mothers past who could all be candidates as they sing and dance to 22 of ABBAs greatest hits!